The Inland Revenue Board of Malaysia (IRBM) has announced that all employers which are companies (including Labuan companies) are mandatory to submit Return Form of an Employer (Form E) via e-Filing for the Year of Remuneration 2016 and onwards in accordance with subsection 83 (1B) of the Income Tax Act (ITA) 1967. WHAT IF A COMPANY SUBMIT FORM E MANUALLY? Form E, if submitted manually by the company (including Labuan companies), will be DEEMED NOT RECEIVED for such purposes under subsection 83 (1B) of the ITA 1967. A Form E deemed not received is a failure to comply and is an offence under Paragraph 120(1)(b), of the Income Tax Act (ITA) 1967. Upon conviction, employers may be liable to a fine of RM 200.00 to RM 2,000.00 or imprisonment (not more than 6 month) or both. The e-Filing system for submission of Form E for the year of Remuneration 2016 will be opened beginning 1 March 2017. Companies which are dormant and/or have not commenced business are required to furnish the Form E with effect from year of assessment 2014. 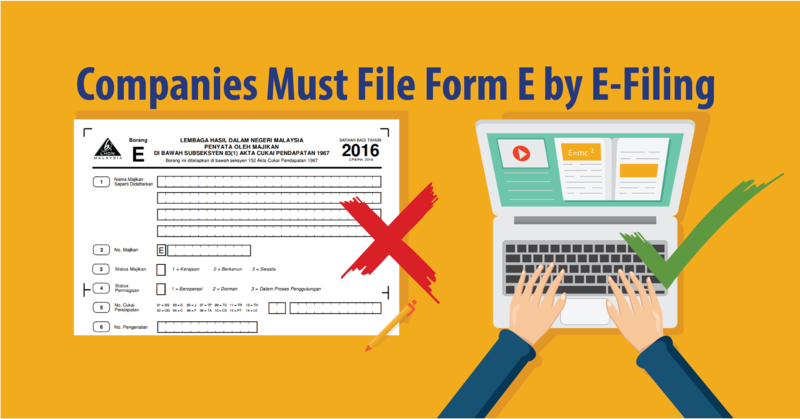 Employers other than companies have the option to submit Form E via e-Filing or manually (Paper Form). The due date for manual submission of Form E for the year of Remuneration 2016 is on 31 March 2017. 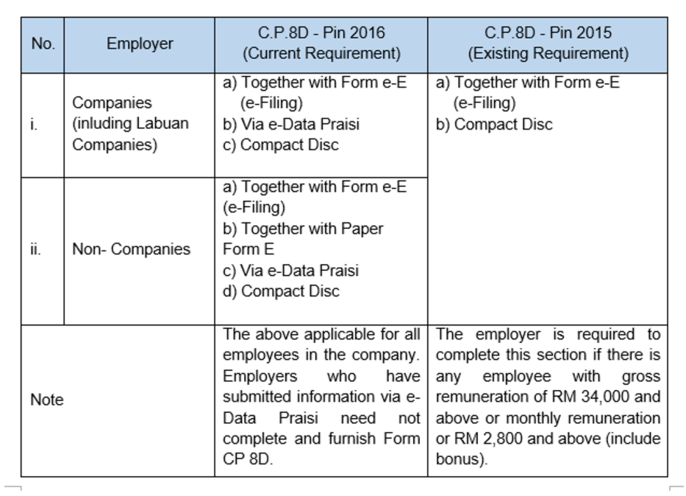 Employers which are non-companies are required to use the Malay Language version of Form E (CP8-Pin. 2016). Employers are encouraged to furnish the particulars online using eData Praisi which can be accessed via the LHDNM Official Portal before or on 22 February 2017. The format for Information_Layout For Prefill can be obtained from the LHDNM Official Portal. What is E-Data Praisi System? The IRB has implemented the e-Data Praisi system which is an online system developed for employers to upload the employees’ salary income information in the form of Prefilled data follows the specification set by the IRB. The Prefill data is the employee income data and the data will be included in the employee e-Form. When the employee fill in the e-BE / e-B / e-BT / e-M / e-MT, the salary income information will automatically appear on the e-Form. This will save time and simplify the user's process. However, the data can still be amended if there are changes before signing and submission of the form electronically. Pre-fill data via e-Data Paisi system for year of assessment 2016 will be closing on 22 February 2017. Please be advised that it is the employer’s responsibility to complete the form E and return it promptly to the Inland Revenue Board. Penalties ranging from RM200 to RM20,000 or to imprisonment for a term not exceeding 6 months or both will be imposed if you fail to comply with the stipulated filing date. Employers are reminded to prepare and provide the Yearly Remuneration Statement (EA and EC Forms) to all employees by 28 February 2017 to allow them to complete and submit their Income Tax Return Forms within the stipulated time frame. With the introduction of Section 83A in the Income Tax Act 1967 pursuant to the 2012 Budget announcement, every company is required to prepare and provide copies of the prescribe form (Form CP58) to its agents, dealers or distributors. The Form CP58 only needs to be prepared and issue by the payer company to agents, dealers, or distributors if the total value of monetary and non-monetary incentives for the calendar year is more than RM5,000/- per annum. Monetary and non-monetary incentives received by agents, dealers or distributors are considered as business income and should be reported in the year of assessment the incentive is received. Failure to prepare and furnish the statement to the relevant agents, dealers or distributors within the stipulated deadline is an offence and shall, on conviction, be liable to a fine of not less than RM200 and not more than RM20,000 or to imprisonment for a term not exceeding 6 months or both under subsection 120(1) of the same Act. This article is shared by YYC. We found many SMEs are unaware that they are required to submit Form E, while the Inland Revenue Board has announced the new version of EA Form. Therefore, besides article sharing, YYC is also holding a Form E workshop to guide you on how to fill in the Form E correctly and guide you on the new version of EA Form. - Be aware of penalties for late submission.